A friend of ours has a company of dump trucks. I was asked to commission a truck cake for their to be 13 year old son. 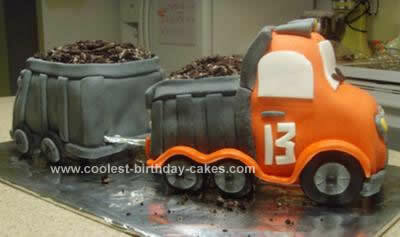 His mother suggested a Homemade Double Dump Truck Cake and said that orange was his favorite color. After making the main truck and realizing it was rather small (they needed to feed 10 to 12 people) I decided to add the additional dump trailer being pulled by the main truck. This was my very first attempt at a marshmallow fondant covered cake and after I finished I realized I had taken on quite a project for a rookie. The marshmallow fondant was the best fondant recipe I found. It’s basically melted marshmallows and confectioners sugar. A one pound bag of marshmallows melted in the microwave and then about 2 pounds of confectioners sugar kneaded into it on a well greased (shortening) counter top. I find that gel food coloring works best as it doesn’t alter the texture of the fondant. After baking 2 cakes mixes in 4 loaf pans I layered two together for the man main truck and then 2 for the additional dump bed using a basic buttercream recipe. I froze the cakes for a couple hours and then carved them into shape and covered them with more buttercream frosting. After letting that dry I colored, rolled and cut the fondant into the shapes I needed. The wheels were done ahead of time to have time to dry. I would make them with a gum paste next time since that will dry better. The just moistened with a little water to get them to stay on the truck. I made support for under the cake with layers of foam core board that I glued together and covered with foil. The trick here is to make the support the same size as the bottom of the cake. 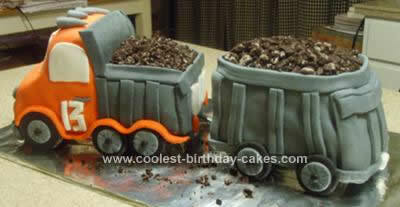 The dump trailers were not hollowed out as I wanted to have as much cake available as possible. When they were finished I crushed some chocolate sandwich cookies to look like “dirt” and put it in the beds of the trailers and scattered some on the cake board as well. It was such a hit that the birthday boy would not let them cut the truck cake. Two weeks later and he still won’t let them cut it. I understand the extra dump trailer was devoured in no time. I know some fondants do not have a good flavor, but this one tastes like marshmallows and everyone loved it.